Multi Industry Award Winner, Lithodomos VR produce incredibly accurate and realistic recreations of ancient archaeological sites, providing a highly immersive virtual reality experiences for their clients. Digital Rescue enjoyed investing the time to work closely with the highly passionate team at Lithodomos VR. Jointly we created a highly detailed and comprehensive website design brief to develop a stand out strategy against industry competitors. A Virtual Reality website must be as immersive, engaging and exciting as the VR experience itself. 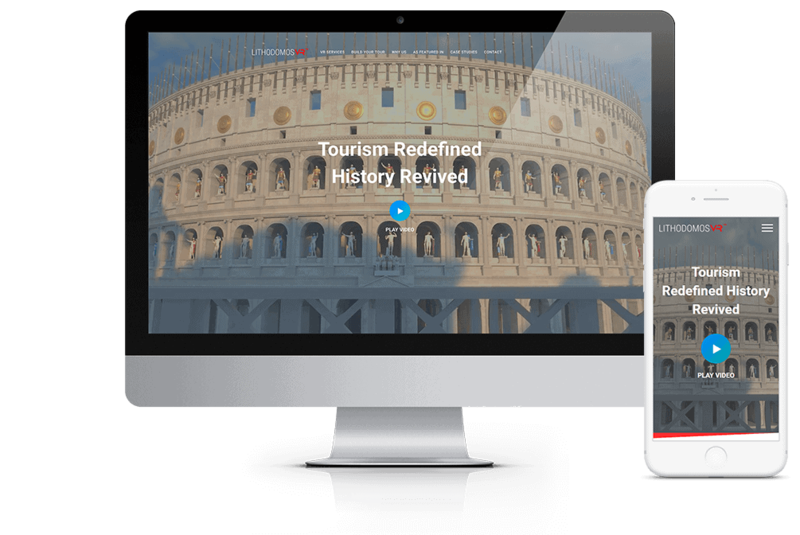 To this end Digital Rescue recommended a home page video production to help summarise the service offering, the quality of the VR experience and ultimately Lithodomos VR’s credibility and point of difference. When we moved from being a fledging start-up to a global scale-up, we needed to up the ante on our web presence. That is when we contacted Noam and his team. Noam and Estelle got the brief first time, worked seamlessly to create the amazing web site that we now have. They brought together all the necessary elements we needed: video, mobile optimisation, self-help and SEO. We would highly recommend the team as they are professional, experienced and represent outstanding value for money.